PROUD is a registered student organization that raises puppies for The Seeing Eye. It consists of both puppy raisers and puppy sitters whose job is to expose the young dogs to as many situations as possible to prepare them for their future job as a guide dog. 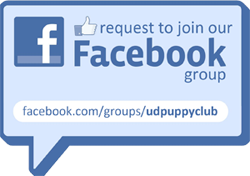 To help with this, our puppies come with us to many of the places we go including class, club meetings and events. Our club also has special approved housing areas where our puppies live with us. It is a very time-consuming commitment, as our raisers are responsible for the puppy’s complete care, as well as basic obedience and manners. The dogs that are raised by PROUD come from The Seeing Eye, which is located in Morristown, NJ. The Seeing Eye is a guide dog school that breeds and trains Labrador Retrievers, Golden Retrievers, German Shepherds, and Lab-Golden Crosses to become guide dogs for the visually impaired. The Seeing Eye was established in 1929 and is the oldest guide dog school in the world. The Seeing Eye relies on volunteers to raise their puppies in a loving environment until the dog is old enough to return to the school for formal training. Volunteers receive a puppy when it is 7-8 weeks old and typically keep the animal until it is 13-15 months of age. During this time period the puppy raisers give the dogs affection, teach them basic obedience and expose them to a variety of social situations. PROUD holds bi-monthly meetings on the 1st Tuesday and 3rd Sunday of every month to provide training and socialization for puppies (and members!). Additional weekly trips and events are held to help expose the puppies to a variety of social situations, sights, smells and sounds. Examples include shopping malls, movie theaters, libraries, sporting events, community events, parks, and museums.If you would like to become involved with our club, or have any questions, please contact us or stop by one of our meetings. We hope to see you there!